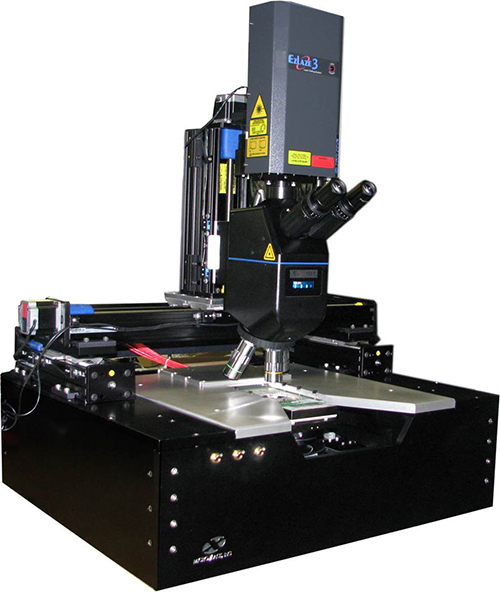 The LCS-4000 Probe Station with Integrated Laser Cutting System gives the user maximum flexibility in semiconductor diagnostic cutting, failure analysis, trimming, marking and topside layer removal. All of these functions can be performed on a microscopic level, all on this one system, which provides a high level of performance that is remarkably easy to use. The integrated laser cutting system can be used to alter conductors on integrated circuits by laser ablating contact leads, sacrificial layers and other materials without damage to the devise internals. 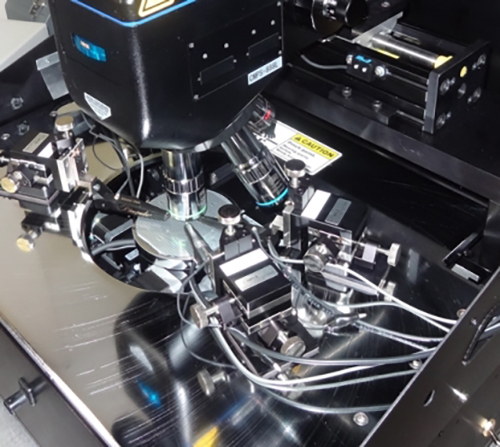 This laser trimming process allows for selective layer removal, such as topside layer removal, and can aid in semiconductor failure analysis or for fine tuning device characteristics, such as resistance, capacitance or RF properties. MicroXact’s laser cutting system is also capable of isolating faulty components by cutting the metal lines that connect the faulty component to the rest of the circuit. Pre-built logic includes automated identification of faulty devices on the wafer and erasing these devices from the wafer completely via ablation. The LCS-4000 is offered as a motorized, semi-automated or fully-automated configuration system and can easily be configured for a wide range of applications with a variety of design options and accessories available. System integrates the Laser Cutting System for selectively removing material, such as topside layer removal, making high-precision cuts and marking metal. Designed for simultaneous DC and/or RF probing while laser trimming leads or removing defects from devices. Fully motorized system allows user to remotely position the sample stage, the platen and the microscope independently while the system is entirely contained in a light-tight enclosure for safe and easy operation of the system. Standard configuration includes independent 100 mm x 100 mm range of motion for sample stage and microscope (larger ranges available). Multi-axis dual joystick controller provides easy operation of all motion components and can be customized to include a variety of additional functions. 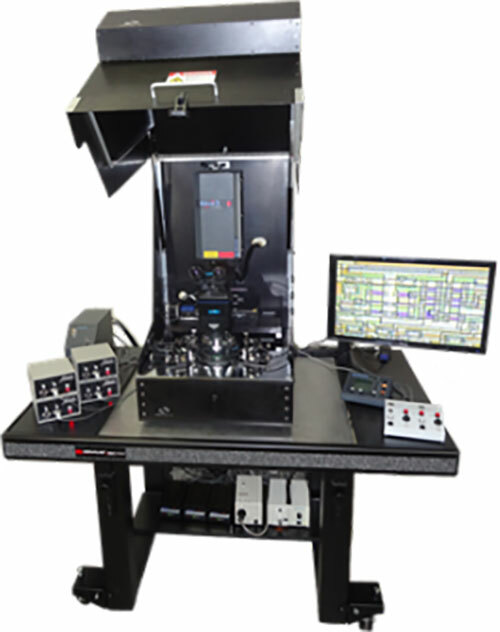 System can be upgraded to include semi-automated control of wafer probing. Isolated feed-through terminals located on both sides of station for convenient connection to micropositioners can be customized for BNC, Triax, or DC pin connections. The following specifications are for a standard configuration. In most cases, each LCS-4000 Probe Station system can be customized to exceed these values. Variety of high-resolution compound microscopes fitted for laser systems. Choice of laser capable of 2 or 3 wavelengths. Precision XY stage with pneumatic position lock and single-hand positioning. Polished brass or gold-plated adjustable vacuum chucks. +/-2.5μm flatness of the chuck. Thermal chuck with temperature range of -100°C to +200°C. Optional choice of XY translation stage for microscope provides 2.5" x 2.5" range of motion.